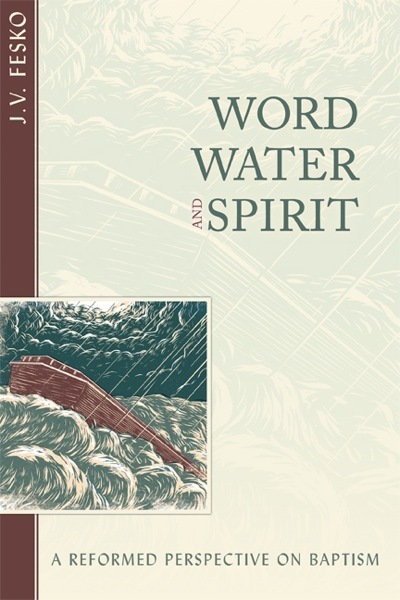 Word, Water, and Spirit: A Reformed Perspective on Baptism, by J. V. Fesko. Published by Reformation Heritage Books, 2010. Hardback, 455 pages, list price $35.00. Reviewed by OP pastor Everett A. Henes. Dr. Fesko has done a great service to the church by writing on the subject of baptism. Many modern Reformed treatments are too short and narrow in their focus, oftentimes looking only at the question of infant baptism. Fesko examines baptism through historical, biblical, and systematic theology. He understands Scripture as a unified whole that unfolds by way of covenant throughout redemptive history. Section one surveys the history of the doctrine and practice of baptism. The historical approach does not provide as "neat" an answer as either credo- or paedobaptists would prefer, particularly regarding the questions of mode and recipients. Fesko shows how a focus on personal experience in salvation often came to exclude infants from being baptized. Section two deals with the crucial biblical evidence, with chapters on baptism as new creation, as covenant judgment, and as eschatological judgment. As new creation, baptism is rooted in Genesis 1:2 and linked to the Flood and the Exodus. In all of these watery ordeals, a new creation emerges. Explored next is the idea of circumcision as covenant judgment, followed by the connection of circumcision to baptism and baptism as covenant judgment. This provides a background to Jesus' statement to his disciples, "I have a baptism to be baptized with, and how great is my distress until it is accomplished!" (Luke 12:50). The point of this is to show that in Christ being judged, his people receive the blessing, but "for those who undergo the waters of baptism and never have faith in Christ, the waters of baptism are those of covenant-judgment" (p. 245). In "Baptism as Eschatological Judgment," we read of the baptism of fire that John the Baptist refers to in the Gospels. The Spirit-fire baptism is, to the church, a blessing; but to the unregenerate world, a coming judgment. Section three presents a positive formulation of baptism through systematic theology. Fesko looks at baptism as a means of grace and as a sacrament. He examines the institution of the sacrament, the formula used, and what is signified in baptism: initiation into the covenant community and union with Christ. Just as infants in the Old Testament were given the covenant sign (circumcision) of the gospel, so infants in the New Testament are to be baptized. Fesko also argues that the inclusion of infants in one sacrament (baptism) does not entail their inclusion in the other (Lord's Supper). In "Baptism and Ecclesiology," he returns to a historical discussion to argue that a valid baptism depends solely on who ultimately administers it (p. 369). The Reformers held that God was active in baptism and, therefore, any baptism done with water in the name of the Father, Son, and Holy Spirit is valid. As the pastor of a church that has many Baptists who regularly attend, I have found this book to be a good one to recommend for reading and useful in improving my own understanding of baptism.